I peek out of the cabin window at the setting moon that bathes the river and trees in pale blue light. By the time we get up a dense fog has formed over the river, obliterating everything except the ghostly trees. A black cormorant dashes through the mist while ducks cruise by, oblivious to it all. We are docked at Issel, a port not far from the ancient city of Trier, the city that we will visit today. By the time we leave, the fog has lifted into a low overcast .On the bus our tour leader comments as we head for Trier, preparing us for what we plan to see. As our bus enters the outskirts of the city, it seems like a non-descript town. I see nothing outstanding except the mass of cars all trying to use the road at the same time. As Trier was once a Roman town, the remnants of it are widespread, many of the ruins being preserved. We drive slowly down a divided street, the center portion planted in grass and trees. This, we are told, is where the old city wall once guarded the city. We pass the Roman Barbara and Kaiser Baths, both well preserved. We depart the bus at the Constantine Basilica where this first Christian emperor once presided. 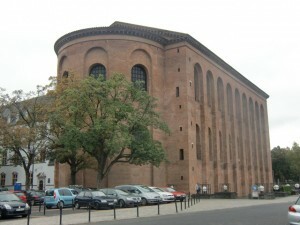 The huge structure is composed of Roman brick and mortar, a most imposing building. Two sets of high arched windows allow light into the interior. The walls and floors were once heated all day long with hypocausts, the vent holes for the escaping smoke still visible on the outside walls. Built in 330 AD, it was once stuccoed and painted with a red trim. 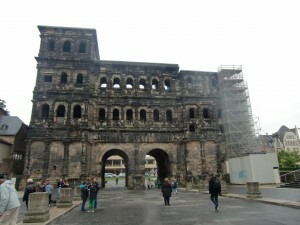 The Romans tried to make it look like the buildings in Rome, Trier being considered as a second Rome. 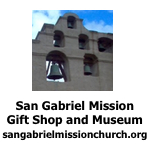 The basilica was damaged in World War II bombings, then restored to what we see today. The interior was once lined with marble, and was said to be magnificent to behold. Today the walls are plain, but to sit in such a vast interior and imagine that Constantine once held sway here, takes us back to a distant era. The Romans left in 400 AD, leaving it to the German tribes. Today it is a Protestant church, the Church of the Redeemer. We move on, less than a block, to two majestic churches, one right across the street from each other. One is very old and Romanesque, the High Cathedral of St. Peter in Trier, and the other is Gothic in style, the Church of Our Dear Lady, as it was built by the French. We stand on the very spot where Constantine baptized people into the Catholic Church. People would stand in long lines to be baptized as they were convinced they would have no future unless they became Catholic. 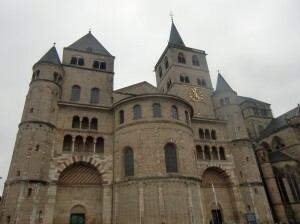 In Trier and in nearby Luxemburg the population is still over 90% Catholic. Trier’s market place is in a square surrounded by medieval buildings, many of which were damaged during the war but then carefully restored to appear as they were before the bombing. They like their old buildings and so do the tourists. Today, only flowers are on sale in the market. Religious symbols are still prominent around the market place, the Virgin Mary displayed on the corner of one building. The bishop was considered to be the master of the market. Leaving the old portion of Trier, we enter a wide pedestrian mall lined with modern shops and department stores. The street is crowded with locals and tourists, especially teenagers from France who turn up their noses at German food and rush to McDonald’s where they inundate the place, happy to pay ten dollars for a Big Mac. We pause by a house where Karl Marx once lived as a child. The bottom floor of this place is now a “One Euro Store”, similar to our 99 cent stores. What would Marx think about that? At the end of the pedestrian mall is the Porta Negra, the old Roman entrance to the city, now blackened with age. 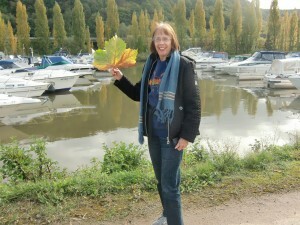 After lunch back on the boat, Dolores and I stroll along the Mosel River. On one side of the river are hayfields, vineyards on the other. The day had brightened and warmed, only a few clouds drifting in a blue sky. It is so peaceful walking leisurely along the flowing water. At the end of the walk we come upon a marina and a campground. Along one side of the path grow brambles and tall grasses as well as colonies of mushrooms. Dolores picks up a huge sycamore leaf, large enough to cover her whole face. We sit together on a bench, relax and watch the flow of the river. We begin our tour at the Constantine Basilica, built in 330 AD and presided over by Emperior Constantine, the first Catholic Emperor. This Romanesque church, built about 1060 is called the High Cathedral of St. Peter in Trier and is directly across the street from the Gothic The Church of Our Dear Lady. The Porta Negra, at the end of the pedestrian mall, is what is left of the original Roman gate to the city, now blackened with age. In the afternoon we take a leisurely stroll along the Mosel River. Dolores finds a giant sycamore leaf larger than her face.